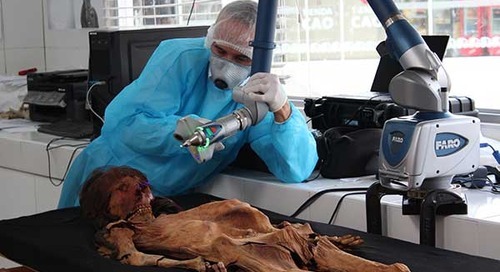 The Forensic ScanArm is a high-resolution, portable, non-contact 3D scanning solution tailored for forensic anthropology, crime lab and medical examiner applications. Explore how forensic artist Joe Mullins uses the ScanArm to assist in the digital reconstruction of skulls to analyze 3D characteristics for quicker and easier identification of remains. This whitepaper details use of a 3D laser scanning attachment for the FaroArm and how the blue laser outperforms a typical red laser for 50% better optical resolution and reduction in speckle noise.